Airship pages of Jens Schenkenberger - News 2007 - Special exhibition "Blimps from Akron"
The Goodyear Tire & Rubber Company Akron, Ohio, is able to look back on the longest continuous tradition in airship production and built the most non-rigid airships worldwide - more than 300 blimps until today. The Zeppelin Museum Friedrichshafen (at Lake Constance in Germany) dedicates one of its special exhibitions at the "Grenz-Raum" to this very outstanding history. 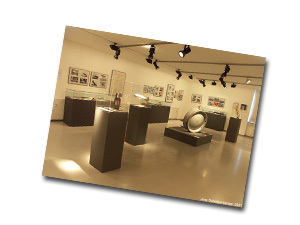 Jens Schenkenberger, together with Jürgen Bleibler, the manager of the Zeppelin Department of the Museum, planned and implemented the exhibition. On display are models, authentic airship parts, photos, magazines, merchandise, press kits, historical and technical literature, e.g. technical manuals or a pilot's handbook - exclusively of the Goodyear company. The oldest exhibit is from 1912. But what is a blimp? 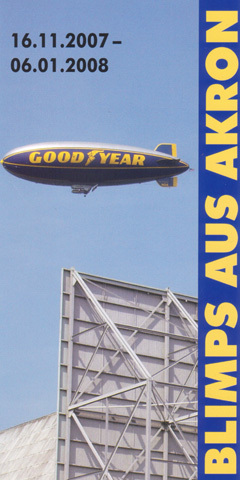 In the U.S. "blimp" is an expression used for an airship as popular as "Zeppelin" in Germany. 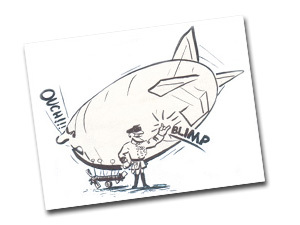 Correctly, "blimp" has to be used for non-rigid airships only. Herewith I would like to thank the whole team of the museum very, very much, especially Jürgen Bleibler (Manager of the Zeppelin Department), Jessica Siebeneich (Intern / Trainee), Martin Rzehaczek, Michael Fischer und Alexander Scheffhold (Facility Management), Heike Vogel (Museum Education), Heiner Middeldorf (IT) and Sabine Ochaba (Press- and Public Relations). Thank you so much for the nice time!